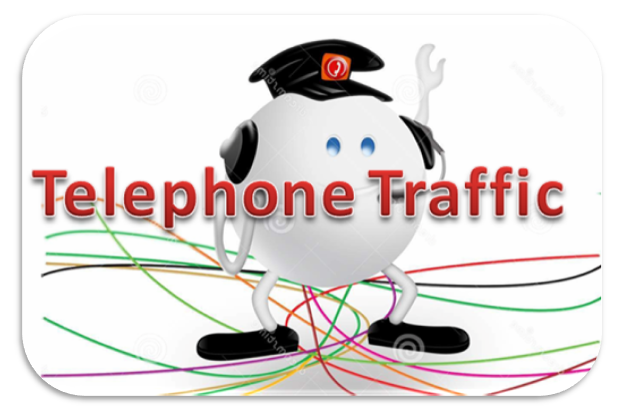 How to Define Telephone Traffic? Telephone traffic is originated by the individual needs of different subscribers and so it is beyond the control of telephone administration. Any and every subscriber can originate a call at any and every moment without giving any previous information and the duration of calls is also not previously known. Although the individual telephone traffic originates at random, the average telephone traffic for a particular exchange follows the general pattern of activity in the exchange area. Normally there is a peak in morning, a dip during lunch period followed by a afternoon peak. In some localities the traffic has seasonal characteristic, for example at a holiday resort. 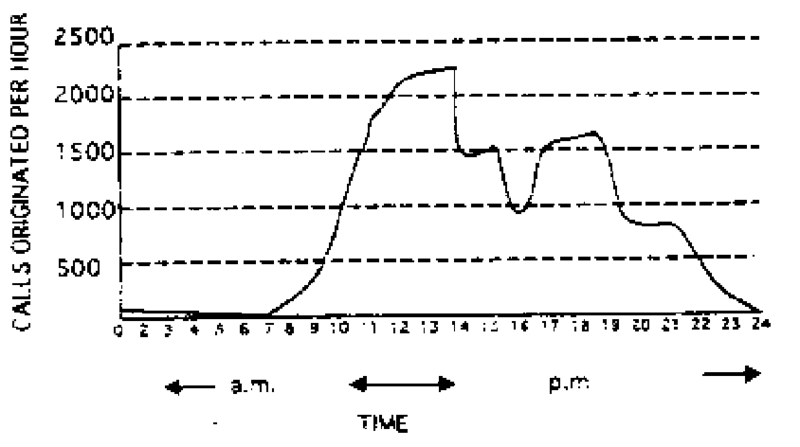 A typical 24 hours variations in calling rate is shown below. 2.1 Whatever be the nature of variation of traffic, a telephone engineer is interested in maximum traffic that occurs in an exchange. The hour in which maximum traffic usually occurs in an exchange is known as Busy Hour. Busy Hour Traffic is the average value of maximum traffic in the busy hour. In computing Busy Hour Traffic the seasonal effects are also taken into account. Sometimes it is convenient to refer to Busy hour calling rate (BHCR). Busy hour calling rate is the number of calls originated per subscriber in the busy hour. This provides a simple means for designing the exchange with respect to the number of subscribers. It also provides probable growth of traffic to the estimated growth in number of subscribers. The busy hour calling rate may vary about 0.3 for a small country exchange and 1.5 or more for a busy exchange in business area in a city. When the volume of traffic is quoted in terms of number of calls originated in a given time, this is insufficient to determine the consequent occupancy of lines and equipment. Therefore, measurement of traffic should not only consider number of calls but also their duration. The duration during which equipments and circuits are held when a call is made is called HOLDING TIME. Normally, it is average holding time per call for the particular item of equipment that is taken into account, so far as the caller is concerned the useful time is during the conversation only. However, the total time during which equipments and circuits are held when a call is made also includes, the period during which call is being established and time taken to release the equipment after the call has concluded. 2.2 Measurement of Telephone Traffic. The total cost of providing telephone service can be roughly divided into those charge which are constant and independent of volume of traffic and those, which are determined by the amount of traffic. The cost of subscriber’s line and instrument and certain individual equipment in the exchange is totally independent of the volume of traffic. The quantity of common switching equipment required is almost entirely dependent by volume of traffic. The quantity of such equipment is dependent not only on number of calls but also on duration of calls. Therefore to determine the quantity of switching equipment in automatic exchange or staffing in manual exchange telephone traffic may be measured in terms of both the number of calls and the duration of calls. For certain purpose it is sufficient to specify a Traffic Volume which is product of number of calls occurred during the time concerned by their average duration. however for the purposes of automatic exchange a more precise unit of traffic flow is required. this is called Traffic Intensity. Traffic intensity is the average number of calls simultaneously in progress. The unit of traffic intensity is Erlang. A traffic intensity of one erlang is obtained in any specified period when the average number of calls simultaneously in progress during that period in unity. The specified period is always one hour and is taken as being the busy hour unless some other period is indicated. There is a more precise way to define traffic intensity. The average Traffic Intensity during a specified period T, carried by a group of circuits or equipments, is given by the sum of the holding times divided by T. The holding times and period T all being expressed in the same unit. Sometime it is stated that the average traffic intensity is equal to the average number of calls, which originate during the average holding time.All the above three definitions give the same numerical result. The foregoing relationships may be expressed symbolically as follows. Let S be sum of holding times during a given period T , both expressed in hours. Then by definition. It also follows that when the average call duration is known, the average call intensity can be obtained by determining the number of calls occurring during the period T. Also because A is equal to average number of calls simultaneously in progress, an approximate value of A can be obtained by counting the number of occupied circuits or equipments at uniform interval during the time T and finding the average value. that during the busy hour some calls may fail to mature due to insufficiency of switching equipment. To ensure that the number of calls so lost is reasonably small, it is the standard practice switching equipment such that on the average not more than one call out of every 500 in the busy hour is lost at each switching stage, with the provision that loss does not fall below 1 in 100 with a 10 percent increase of traffic.